Eastern Air Lines DC-2, NC 13736, served as a passenger aircraft until it was purchased, along with 10 other remaining DC-2’s by the British Purchasing Commission in the USA, on behalf of the Australian Government. In 1941 the aircraft was brought on RAAF charge as A30-11. It had been disassembled by Eastern Air Lines for freighting and was reassembled at Laverton No1 Aircraft Depot in Victoria where new Wright Cyclone R1820 radial engines were installed. A month later it was sent to Point Cook, Victoria to train radio operators in the No 1 Service Flying Training School. In 1942, after an engine change at Essendon by Australian National Airways (ANA) it was received at the No1 Wireless Air Gunners School, RAAF Station Ballarat, Victoria, for use as a wireless and radio navigation trainer. In April of 1942, it was modified and painted in camouflage colours with the 36 Squadron code “RE-B” on the sides of the fuselage and given the transport call sign “VH-CRE” painted on the tail. It was completely overhauled again by ANA at Essendon, for conversion to a transport for aircraft engines. The DC-2’s operational duties included a run from Laverton, Victoria to Batchelor , NT and return. It transported engines from No5 Depot at Wagga Wagga, to Pearce in WA. After a few mishaps and minor damage, the aircraft continued as a “workhorse” transport vehicle moving between, Tocumwal, Victoria, Parafield, South Australia and Richmond, NSW. It crashed in 1945 during a forced landing at Parafield suffering major damage to the fuselage, starboard wing and undercarriage. It had been issued to 37 Squadron, whose 3 crew and 12 passengers were unhurt. By the end of the war, the aircraft was considered useable only for components and although offered by the Commonwealth Disposals Commission to the Department of Civil Aviation for their use, the offered was declined. In October 1946, the airframe was sold to Sid Marshall of Marshall Airways, Mascot, NSW. The airframe had been dismantled and stored at Parafield in SA. Sid Marshall collected the aircraft and stored the parts on a nearby farm until 1954. He then attempted to move the aircraft back to Sydney in order to use it for spare parts for other DC-2’s he had purchased. Unfortunately the truck transporting the aircraft broke down on the Glen Osmond Road as it was leaving Adelaide and some of the wing sections were left at a garage and stored for 12 years. In 1966 Sid Marshall returned for the wings and they were transported to Sydney and stored with other DC-2 parts in a storage compound at Bankstown Airport where it remained until 1979 when it was sold to the West Albury Rotary Club. 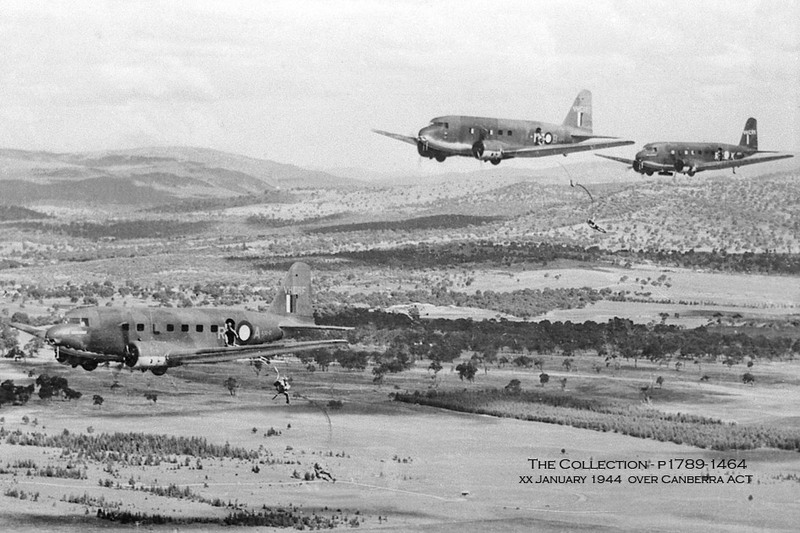 RAAF photo of DC-2s in flight over Canberra, 1944.